Every member shall attend to the ordinances of the church–namely, baptism (Matthew 28:19, Acts 2:38) and the Lord’s Supper (Matthew 26:26-28, 1 Corinthians 11:23-29); shall be diligent in prayer (1 Thessalonians 5:17) and the study of God’s Word (2 Timothy 2:15). Further, it is the responsibility of all members of the church to serve with time and talent, and to contribute to the financial interests of the church in proportion to their ability, as God has prospered them. All persons should walk as in the presence of God and accustom themselves to a close communion with God in all of their employments (Colossians 2:6; Psalm 1:1,2; Romans 8:1-6). They should never speak evil of their fellow beings (Ephesians 4:25, 29, 31; Titus 3:2; James 3:5-10), but practice love toward others (Mark 12:31), rendering service to others (Luke 10:28-37, Galatians 5:13), and endeavoring to be a follower of Christ in deed (Colossians 3:17, 23), in order that a spirit of unity may exist (Ephesians 4:3). Following the example of the early disciples and New Testament church, everyone should make provision for exercises of devotion on Sunday, the Lord’s Day, and inasmuch as possible shall attend all services for hearing read the Word of God, singing spiritual songs and hymns, Christian fellowship, and giving of tithes and offerings (John 20:19, 1 Corinthians 16:2, Hebrews 10:25). Members are admonished to neither buy nor sell needlessly on the Lord’s Day. 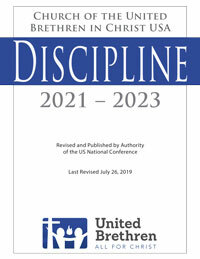 Since every Christian is called to be a witness to Christ (Acts 8:26-39) in the midst of ungodly people and circumstances (Acts 1:8), and since it is largely through the testimony of believers that others are brought to a saving knowledge of Christ, we urge every member of the church to assume the obligation of seeking the lost and winning them to Christ. 1. By engaging only in such business and social activity which is consistent with the Christian life (Colossians 3:17, 23). 2. By observing modesty in dress, in speech, and in all other personal conduct as becomes a child of God (1 John 2:15-17; 1 Peter 3:3-4). 3. By renouncing the world and all ungodliness, seeking to lead a life of holiness and devotion to God and his cause (2 Corinthians 7:1; 2 Timothy 2:19, 21). 1. Be deeply convinced of the absolute necessity of union (Ephesians 4:3). 2. Pray earnestly for and speak truly and freely to each other (James 5:16). 3. When we meet, never part without prayer, if prayer is at all practicable. 4. Take care not to despise each other’s gifts (Romans 12:3-8). 5. Never speak lightly of each other (James 4:11). 6. Defend each other’s character in everything, so far as is consistent with truth (Ephesians 4:31). 7. Labor in honor, each preferring another before himself (Philippians 2:3). 8. Seriously examine the cause, evils, and cures of heart and church divisions (Galatians 5:26). 9. Observe and follow the principles for reconciliation or excommunication laid down by Jesus in Matthew 5:21-26 and 18:15-17 whenever an offense exists between members of the congregation. We believe that the mode of testifying to the truth, when required to do so in a legal form, by way of affirmation is on us solemnly, conscientiously and fully binding before God to tell the truth, the whole truth, and nothing but the truth (Matthew 5:33-37).